There was talk yesterday around the internet about what "muse" is. Carrie Ryan started it by asking on twitter, "how do you define muse?" Jackson Pearce, author of AS YOU WISH, responded to the question HERE. Saundra Mitchell, author of SHADOWED SUMMER, responded with her thoughts HERE. So I've been thinking about it as it relates to me and what I think, and I have to admit, the idea of a muse has always seemed a little strange to me. I might even go so far as to say, I've never really understood what people mean when they talk about their muse, like it's something that needs to act in a certain way to have a good writing day. I've even heard the term applied to objects or people - "She is my muse," as if she brings out the creativity in the person. Do I have a muse who tells me what to write about? No. I get my ideas by journaling and brainstorming and thinking "what if" over and over and over again. Okay, once in a hundred years, I apparently have a dream that would make a good book, like I did with I HEART YOU, YOU HAUNT ME. But most of the time, it's me thinking and thinking and THINKING on ideas. So, if this is what people think of when they hear the word muse - that which tells us what to write about - then I don't have one, and I definitely want one! However, my guess is that most people are talking about what Saundra talks about in her post. A good writing day is that day when the words flow like water, and things appear in your story you never could have imagined, and yet, they appear and they are perfect and at the end of the day, it's unbelievable to you how all of that just happened. In those moments, we are grateful, and it feels like we should thank someone, so people thank their muse. Personally, I send up a thank you to God. But that's me. I have always called those incredible writing moments "magical moments." I have a couple of books that are full of them. And I have some books that only have a few - where most of it was blood, sweat and tears and me just doing the best I could, word by word. Can you, the reader, tell in my books when the magical moments happened as I wrote, and and when they didn't? I'm guessing no. I'm also guessing that no matter what your profession, there will be days where everything clicks and you're on top of the world, and days where they just don't. It's yin and yang, no? Generally, I do believe writing is about discipline and hard work. It's about opening the document day after day and starting in when you feel rusty and you don't know if you really feel like writing or not. But I cannot deny that at times, it feels as if something takes over. As if I am no longer thinking of the words to go on the page, but instead, channeling the story from somewhere, and simply getting it all down. You may call it muse. I may call it magic. Whatever it is, I know we all want more of it. But we only get it by sitting down and opening the document. I really wanted to go to the beach today and spend time in the town where my WIP is set. It's supposed to be clear and sunny, which doesn't happen very often on the Oregon coast. But my husband couldn't go today, and he said he really wants to go with me when I go. So, I'll wait, and keep writing, using my memories I have to write for now. I can always leave out details and fill them in later. It's hard for me to do that, but if I must, I will. I've been getting some wonderful e-mails lately from readers who have enjoyed CHASING BROOKLYN. And many of them ask - what are you working on now? When will it be out?? I feel bad that I can't tell them. I mean, I could tell them the premise, but I don't like to do that, except with my husband and kids, and close writing friends. But I'm thankful they write to me and ask. Because they motivate me to keep going, probably even more than the February 28th deadline. SO, this week, it's about writing - hours and hours of writing every day, as much as I can do!!! Because soon, March will be here, and you know what that means!! I wrote this checklist up about 6 months ago, as I pondered all the things I needed to do to prepare for the release of my third YA, CHASING BROOKLYN. I'd been through a book release before, but realized I could make it easier on myself if I put the things that needed to be done in some kind of organized manner. 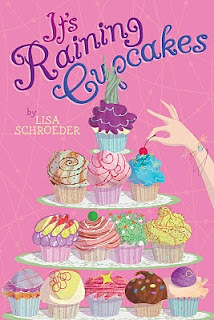 I was looking it over recently, thinking about my next upcoming book, my first middle-grade novel, IT'S RAINING CUPCAKES, and I thought, I bet others would find it helpful - I should share it on my blog! So, I added some helpful information, and I'm sharing! Please note: do not feel like you have to do EVERYTHING on this list. Pick what you WANT to do, and what you think will work best for your book and do those things. I promise, you are not a failure if you don't want to do all of the things listed. I've included everything I could think of because that way, we have many opportunities from which to choose from. If I've missed anything, please do let me know, and I'll add it! And yes, you may print for your own use - enjoy! o Look into speaking opportunities at conferences that will fall in the months after your book is released. They often have opportunities to sell and sign books, so it’s a great way to get out there, meet people and sell books. Once you find these opportunities, you often have to submit a proposal, and there are deadlines, so it’s good to start looking pretty far in advance. o Get bookmarks and/or postcards made (once cover is finalized) and start handing them out as you can to let people know about your book(s). This is ongoing up through release date and beyond. o If you don’t have a web site, now is the time to put the wheels in motion! Don’t have the skills yourself? You’ll want to spend time researching other authors’ web sites, and when you find one you like, take a look at the designer’s site and start making a list of designers to contact. If you already have a web site, how long has it been since you’ve updated the information? Fresh content is important! o Does your book have an angle that would be good for a web site of its own? If so, that should also be created now. o Line up a videographer and send manuscript or questionnaire for the making of a book trailer, if this is something you want to do. o Touch base with the in-house publicist. Ask what he/she plans to do and how you might assist with the efforts. o Work on blog tour and get hosts lined up. Figure out when you want questions sent, how you want to handle prizes, if there will be prizes, and all the other necessary details. o Schedule your book release party at a book store, or a fun location where a book store might be willing to come and sell books. o Schedule book signings in nearby towns, if possible during the first month. Your publicist may want to help with this. o Think about teaming with other authors for book events and approach them about your idea to do group events. o Look into other swag you may want to do for your book – buttons, t-shirts, lip gloss, etc. o Begin gathering addresses of nearby school librarians, language arts teachers, etc. for mailings the month before your signing. o If your book would work well in schools, work on making a teacher’s guide or seek someone out who helps authors make these for a fee. Post to your web site when done. o Put a call out for a street team. Send postcards, bookmarks, other swag to a certain number of people who are willing to talk up the book to their friends, teachers, librarians, etc. 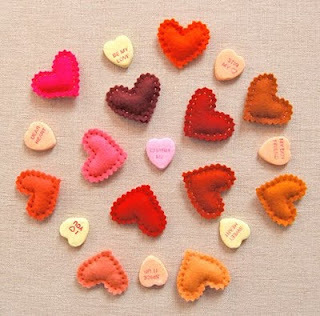 Make them feel special, perhaps give a little gift for helping! o If you are willing to do Skype visits, join the skype author network. o Create an on-line press kit, and get this uploaded to your site. o Start preparing press releases and figure out where to send them. o Make sure your web site has a good, up-to-date bio. o Do some informational blog posts that will hopefully drive people to your blog, but which have nothing to do with your book. Some of the best promotion is simply getting your name out there by offering up helpful information to other people. o If you want to have contests to bring attention to your book, start planning them here. o Send out postcards or letters to school librarians and teachers in your area letting them know about your book, school visit availability, and your scheduled book signings. o Make sure to tweet and blog about any good reviews your book gets, especially from well-known publications. o Look for volunteers to hand out bookmarks and postcards. Drop some by your local school libraries. o Ask people who read and review the book to post the reviews on Amazon and goodreads for further exposure. o If your book signing will include a talk, start preparing that now, and decide where in the book you’ll read. 5-10 minutes of reading is PLENTY. Anything more than that, and you lose people. o Have fun! Enjoy this time! Go to your book signings and other events knowing you did everything could in the months preceding the release to help give your book a fabulous start! When I look out the windows in my family room to the backyard, this is one thing I see. With sunshine and temps in the upper fifties, we seem to be having a preview of spring. Those of you who still see snow, I'll wish for some to come your way! Valentine's Day was just okay. Jennifer Garner is one of my favorite actresses, so she was my favorite part of the movie. Oh, and the teen story lines. They made me laugh. 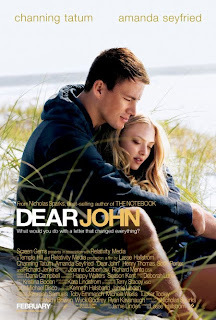 I really liked Dear John, despite the weird ending that many people have hated. I'm a huge fan of Amanda Seyfried. And I thought Channing Tatum did a great job too. I LOVED the music in Dear John and immediately went and bought the soundtrack, and have been listening to it pretty much non-stop. It's great music for my WIP. Apparently another Nicholas Sparks book is coming to the big screen later this year - THE LAST SONG. I tried the audio version of this book and didn't get very far. The dialogue just seemed really stilted to me, and it was painful to listen to. The movie preview didn't look that good to me either - perhaps because Miley plays the main character. Can anyone look at her and see someone besides Hannah Montana? I can't. Watching romantic movies inspires me with my writing. Listening to romantic music inspires me with my writing. And reading helpful blog posts, like this one by Martha Mihalick, remind me of the things to keep in mind when writing a book with romance in it. My biggest take away? "Love stories are best when they're subplots." I think I knew this, but it's good to be reminded of it. Although Nicholas Sparks might disagree. All three of my YA novels have some romance in them. Not a ton. But some. And not the rip-your-clothes-off-and-fall-into-bed kind of romance. The kind where it's the little moments that show you the love between the two characters. I especially love this scene from FAR FROM YOU (out now in paperback, by the way!). I'm working on a new project now, and as I write, I keep thinking back to one of the editorial letters my editor wrote me, where he talked about the growing attraction between two characters. He said, "the reader needs to see the love even before the characters do, and the readers have to be rooting for it." He went on to say, "...I don't see how they truly connect and fall in love for one another." So often it's easy to rely on the instant attraction thing in YA books as to why two teens are drawn to each other. But I think to make it real, you have to SHOW why the two characters are drawn together. After that revision letter, I went to work on that, and it wasn't easy! But I knew it was important. In I HEART YOU, YOU HAUNT ME, we see that Ava admired Jackson's love of adventure. It was so different to her quiet life, filled with books, baking, making CDs for her friends, etc. He made life exciting for her!! Sometimes it's common interests, sometimes it's seeing how someone brings something new to your life that you've been missing, and sometimes it's both. It's going to totally depend on the characters, and understanding who they are and thinking about what they would be looking for in a mate and WHY. We all know teens love romance. But I think doing it well - doing it so it feels genuine, REAL, is not easy. Can you think of examples of books that do the romance thing WELL, where you really get it why the two characters fall for each other? One I can think of is IF I STAY. 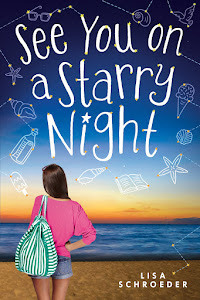 This book was really well received, and I think Gayle did a phenomenal job showing us the love her main character felt for her boyfriend, and where that love came from. 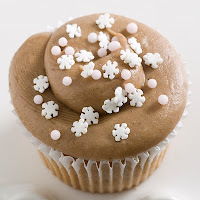 One month from today, on March 9, 2010, IT'S RAINING CUPCAKES will be released by S&S - Aladdin. Only one more month people!!! Are you ready? No? Can't find those pants with the elastic waist? I'm wearing mine already, so bring on the cupcakes!! School Library Journal printed a very nice review last week, in which it ended with, "This story about making dreams come true may encourage young girls to set goals and go after their own dreams." Awwww... well, I certainly hope so!! 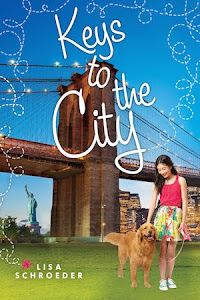 If you are a blogger who reviews middle grade books, would you please let me know? The best way to get in touch with me is to send me a note through my web site - http://lisaschroederbooks.com. Please include your mailing address. I'd like to send a list to my publicist, so she can send some books out. I can't promise you'll get one for sure, but I will try! Also, if you might like to have me on your blog the week of my release date, please let me know. We could do an interview, a giveaway, a cupcake eating contest - it'll be delicious, I promise! After I put up my post about one author's view RE: twitter, which you can find HERE, an unpublished writer asked if I could talk about how to balance the on-line stuff with the writing and other real-life stuff. I think each person has to find his/her own way, to be honest. What's going to work for one person may not work for someone else. But since someone asked ME, I'll share my thoughts. I get up early, about 45 minutes before my kids get up. I spend that time reading and replying to e-mails, reading blogs, posting a blog if I have something to say, and a little bit of twitter. This continues on and off once I get the kids up in between lunch making, breakfast, etc. etc. The takeaway here I think - designated on-line time. Yours might be in the evening or during your lunch hour. It doesn't matter when it is, but give yourself 30 minutes to an hour of social networking time and know that outside of that time, if you're at the computer, you should be writing!!! The exception to this? If you ONLY HAVE 30-60 minutes a day, don't tweet it away! WRITE!!!! Once you figure out when your designated on-line time is going to be, how you want to spend that time is up to you. Keep in mind that if you use twitter efficiently, you can actually use it to help you figure out what blogs you want to read that day. I have lists in twitter - one for publishing news, one for agents/editors, and one for "cool author peeps" (that one is private so no one knows who is on the list except me). By making lists, I can be efficient with my reading. For the most part, I don't do facebook during that on-line time in the morning. To me, facebook is more about fun than business. I only do facebook in the evening, if I have a little free time. I can't tell you how many people have told me they KNOW facebook affects their productivity at their jobs. One real estate agent told me she was banning herself from facebook from 8-5, so she could get back to doing what she needs to do - getting out there and drumming up business. Once the kids are out the door at 8:40, my on-line time is done. It's time to exercise and get myself ready for the day. By 10:00, I should be in my office, ready to work. Some days work means writing, other days it means promotional stuff, but it doesn't mean cruising around the internet! I do check e-mail and twitter throughout the day, however. I like to use twitter as a little reward. One hour of writing gets me a few minutes of twitter time. What we have to remember about twitter is that it's designed so that we can do a few replies, post something interesting, and LEAVE without missing anything directed at us. By clicking on your name with the @ in front of it on the right-hand bar the next time you pop in, you can see any replies you received and respond then if you want to. For pre-published writers, I really think the best use of your social networking time is learning as much as you can about the industry. Look at your blog roll - which ones are helping you and which ones are you reading just for fun? Be honest! I'm not saying you can't have fun, but maybe you spend one hour a week reading the fun blogs, versus one hour a day. Just think if you spent that one hour a day writing instead! I think an important question to ask yourself WEEKLY - am I spending more time on-line than writing? If the answer is yes, something needs to change. Maybe you need to get your writing time in first, before anything else. For me, I remind myself daily that, while social networking IS a part of my job as an author, it doesn't pay the bills. It doesn't give kids or teens new books to read. It doesn't bring me the feeling of having accomplished something. Writing, of course!!! And so that's how I want to spend the majority of my available time. It's a choice. Every day, it's a choice. So we must choose wisely, yes? Wow, I'm so happy there are people out there who are not afraid!! The one thing I hate about contests is I always end up feeling bad that I can't give everyone a prize!! Thanks to everyone for playing and if you pick up a verse novel and like it, please come back and tell me about it, okay? Yes, it's my birthday, and to celebrate, I'm giving away three books - one here, one on the Author2Author blog, and one on twitter. Enter to win in all three places if you'd like! See, here's the thing. I keep hearing from people that some are afraid to read my books because they are called "verse novels." Okay, okay, I understand when something is different, it's easy to think the worst. To assume it's going to be too weird or too hard to read or a hundred other things. But it's kinda like being afraid to try a new flavor of a cupcake. It's still a CUPCAKE!!! I work really hard to make my books accessible, suspenseful, and emotional. And on my birthday, I just wanted to tell you that - so thank you for indulging me on my birthday. To enter, all you have to do is comment and tell me you are not afraid! Or, if you are afraid, but you've decided to face your fears and read one of my books anyway, tell me that! It will make me SOOOOOO happy! I'm also working on the Joy Not Sorrow playlist from the CD Ava gives Brooklyn. Look for that one next week. In the meantime, here are some of the songs you might find on Brooklyn's iPod while training for that sprint triathlon. I’ve had some disappointing moments over the past couple of months. And when you’re in the middle of that disappointment, it’s hard to see beyond it, to know that eventually you’ll come out of it, life goes on, and it will all be okay. When you’re there, surrounded by it, it’s all you can do to just make it through the day. What works best for me is to lose myself in exercise and music alternated with cozy sessions with my journal, where I write down words and brainstorm new story ideas. Because here’s the thing, people. The thing we must try to remember, in the midst of that disappointment. There are ALWAYS new stories to tell. I’m happy to say that I’ve made it through. Believe it or not, I’m now thankful for that disappointment! Isn’t that amazing? I’m actually THANKFUL for it! Because I am now writing a story that I love with my WHOLE, ENTIRE HEART. I had forgotten what it was like to write a book with this much love in your heart for the story you are telling. I was trying to write with other things in mind, none of which were really love. When I write a book from that sincere place of love, I firmly believe there will be others who love it too. So, excuse me if I say farewell to you. My love is calling to me, and I cannot keep it waiting!! You guys, my third novel. THIRD!! I really can't believe it. Thank you to those who have bought it, read it, reviewed it, blogged about it, tweeted about it, and wrote to me about it. Seriously. THANK YOU. Many are saying it's their favorite book of mine yet, and that makes me very happy, because it means my hard work paid off. I wish I could tell you that there is only joy and happiness with a book release. Maybe for others, but not for me. With so many amazing debut novels coming out this year along with some highly anticipated follow-up books in trilogies and series and on and on, for a mid-list author like me, it can be pretty scary. Will my book get lost amongst all the others? I want so much to not be a worrier. To do what I can do, and then let it go. But it's hard. Even harder now that this is my job - not "just for fun" anymore. After all, if I want to keep writing books, I have to sell books. Many books. So, last week, tired of wondering and worrying, I decided the best thing I could do for myself was to start in on a new project. A new book is always the best kind of distraction. I'm participating in GRAPEMO, a month long writing thing sponsored by the amazingly talented YA author Jeannine Garsee, with a personal goal of adding 12,000 words to my new project. I won't be blogging every day, but I'll still be here, a couple of days a week or so. I want to share my tips and tricks with you on getting that first draft down on paper. First drafts are hard for many people, me included. In addition, a reader, Jenn, asked me if I'd do a blog post on juggling all the social networking stuff that a writer has these days in addition to the writing. So look for that later this month. February is here. I have a feeling it's going to be a great month. Let's make it a GREAT month, shall we?